The simplest solution in most cases is to attach a loose certificate with the proper wording. 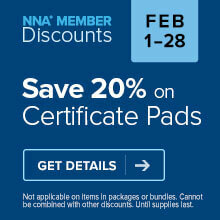 The NNA offers free downloadable notarial certificates for acknowledgments, jurats and proofs for members. Nonmember Notaries can also obtain new CA certificates on the NNA’s website. The California Secretary of State’s office also has the new jurat and acknowledgment wording available for download on its website. Some Notaries have asked if they can write in the new wording on older California certificates. Technically this could be done if there is room and the notice is legible. However, if the Notary forgets a word or writes the notice incorrectly or illegibly, the Notary would be out of compliance. Also, some receiving agencies may choose not to accept handwritten additions. Another option some Notaries asked about is having an ink stamp made with the new required consumer notice wording and stamping it onto older certificates. As with #2 above, it is possible to do this if there is room on the certificate, but remember that the law requires the new California certificate wording to be legible. If the ink impression becomes smudged, it may be unreadable and thus out of compliance. And, Notaries won’t know if they can use the stamp to affix the consumer notice until they see the document at the time of notarization. If they rely only on a stamp to affix the consumer notice, they may be forced to refuse a notarization for failure to have loose certificates on hand. Some Notaries outside of California have asked if they can perform a notarization if presented with a document using the new California wording. In general, if the California certificate substantially complies with any state law prescribing requirements or forms for Notary certificates you may use the California wording. You’ll need to check your state’s regulations to be sure. If the California form does not comply with your state laws, you should instead attach and complete a loose certificate that complies with your state laws. NNA members can also contact the NNA® Hotline with questions about the new California certificate wording law.